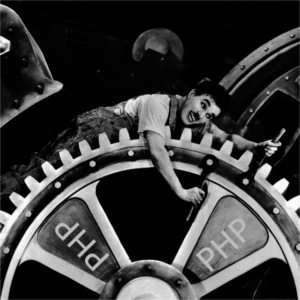 In this series of articles, we will teach you step-by-step how to build with your bare hands a UML to PHP generator. Each time, we will detail: Acceleo code, the identified UML model fragments and how everything is put together. With the keys you will get in these articles, you should be able to code your generator for any language in no time. As you know, the GenMyModel editor enables you to create online models (UML, Database, Flowchart, BPMN), share them and edit them collaboratively. GenMyModel also gives you the ability to generate code from your class diagram to Java, Java-JPA, SQL… using existing code generators. You can also create your own Acceleo generator and code it directly in you browser by using the GenMyModel MTL Editor. This editor provides syntax highlighting, smart autocompletion and type checking. During the code/test process, the MTL editor delegates Acceleo/MTL script compilation and execution to our servers whereas the smart autocompletion and the type checking are performed in your browser. Finally, one of the most useful feature of the MTL editor is the preview mode which gives you a quick feedback about the files generated by your script. Obviously, points 3. and 4. will be repeated all along the development process. Note for impatient people: you can get the full example code of this first article and use it on a very simple class diagram. Let’s try it! Click on Preview and wait for the result. At this point your code is compiled and executed on our server, using your current project as input model. Did you forget to create '[file' block or to call the template which contains it/them? hit CTRL + s in order to save modifications performed on your script. We have two classes, A (which is abstract) and B with an inheritance relation between B and A. Two interfaces C and D with an inheritance relation between C and D. Finally class A implements C interface. and wait for the CatsooLang UML module loading. Then, copy/paste/enter the script below (If you want to learn more about CatsooLang, try the documentation). We are now ready to begin our trip to Acceleo. Line 1. this is the module name definition and the metamodel of the input model. In our case the input metamodel is UML: 'http://www.eclipse.org/uml2/4.0.0/UML'. Line 3. defines a template called generate which can be applied on Class elements. The general syntax for template is [template _visibility_ _tname_(_args_)]...[/template] where _visibility_ can be private or public. If you don’t remember template syntax, you can access code snippets using CTRL + SPACE. Line 4. defines that this template is the main entry point. 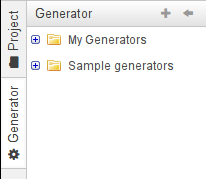 In GenMyModel, your main entry points (yes, entry point_S_) MUST be named generate. Line 5. defines a file block which creates files named after the input class name concatenated with .txt (c.name + '.txt') in an UTF-8 format. Line 6. is the text which will be written in the generated file. All text written in between [file...][/file] tags is written in the generated file. Each code written between [.../] will be interpreted and the result of the expression will be written in the generated file. So, what does this line 6. means? Easy, “write ‘#Hello world from’ in the file then write the class name”. That’s all for this code fragment. As you see, Acceleo and OCL are quite verbose language, but they are quite easy to read. There are many ways for organizing PHP classes: many classes/interfaces per file or one class/interface per file. It depends on what you want, you can apply one strategy or another, it is up to you. In this series of articles, we are going to assume that each class/interface will be generated in its own file. If we launch a Preview of our modified script, two tabs named ‘A.phpandB.php` should appear. Not bad! Great, this is your first generated PHP code! You can type [c. and use smart auto-completion to look through the attribute you can access. Then, you can search for attribute that sounds good (names are pretty explicit so you should find them easily). You can use the CatsooLang terminal to question your model. general : Classifier [1..1]          <-- sounds good, but is Class instance a Classifier? In UML, Generalization elements represent an inheritance relation between two objects. The object that contains the Generalization is the object that inherits from another object. The only thing that should bother you is the [comment @main/]. 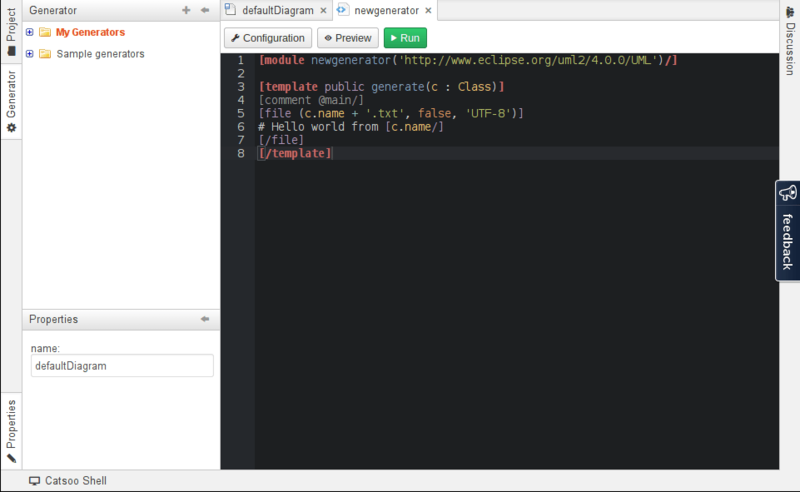 With the one in the generate template for Class, our PHP generator has now two main entry points. Is that possible in Acceleo? Short answer, yes. You can put as many entry points as you want, they all will be evaluated against your input model. And that’s all for Class and Interface. The careful readers and PHP enthusiasts should be boiling at this point: “What about includes? You extend classes, implement interfaces but no includes? Burn him!”. In Class context, if the generalization collection is not empty, we generate an include and for each element of interfaceRealization collection, we generate and include. In Interface context, if the generalization collection is not empty, we generate an include. This time we used [for (...)][/for] tags. The for block enables us to iterate on each element of a collection and to do something with this element. In our case, we iterate on each name of the implemented interfaces and we write the require_once(...) code into the generated file. if, for, file blocks and template definitions in Acceleo. At the end of this article, your generator should generate code for classes, interfaces and it manages class/interface inheritance and class interface implementations. You can find the full code of this first part at this address. 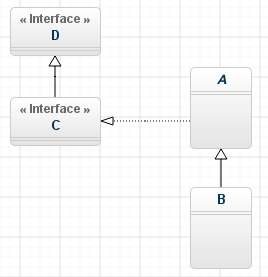 You can find the class diagram as input model in our UML examples. As you probably imagine, there are numerous ways for accessing model elements and generating text in Acceleo. In further articles, we will show you advanced tips to improve your generator speed. Well, this is a goodbye, but let us meet again for the part 2. This time, we will discuss about UML packages and enumerations. I’m sure you guess that we will have to discuss a lot about generation strategies. If you have any question, feel free to comment this post!